25, of Moscow, Maine; assigned to 2nd Battalion, 5th Cavalry Regiment, 1st Brigade Combat Team, 1st Cavalry Division, Fort Hood, Texas; died July 8 in Baghdad of wounds sustained from an improvised explosive device. 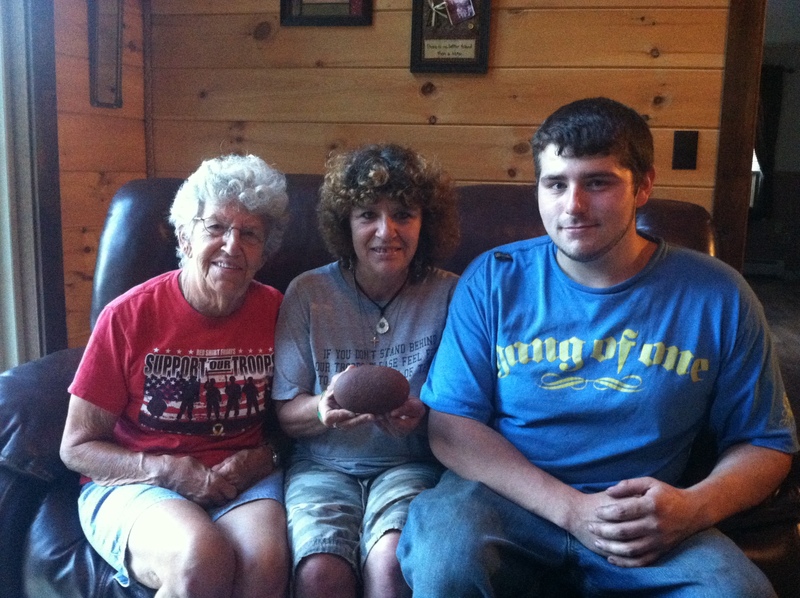 To honor SPC Jason E. Dore, his mother, Gail Dore, his brother, Logan Dore and his grandmother, Lucille Dore retrieved this stone from their home in Moscow, Maine. Watch this video to learn why this stone is significant and what it says about SPC Jason E. Dore. Love this project and thinking of you all! In the summer of 2013, I first learned of the Summit Project. It is impossible for anyone who has ever met Major Dave Cote, to not know of this project and what it stands for. Originally, I had told Dave that I would love to help with this project in any way that I could. If it meant plating food, visiting with families, or organizing materials, I believed and still believe that every single part that is played within the Summit Project, is a worthy endeavor that is essential to making this project a success. There is no small role within this project, and Dave noted this. We are all equals, working together to memorialize the lives of our fallen soldiers. From the hikers to the presence of the families; from the charter drivers to the men, women, and children who lined the streets of Millinocket – each role that every single individual played in this project, was equally powerful, important, and unforgettable. If you supported this project in any way, such as waving a flag street-side: thank you. Thank you. This project was successful because of the power of the people behind this project. And most importantly: because there was a great need for this project. When Dave granted me a role as a hiker, I was extremely honored to dedicate my time to that of Army Specialist Jason E. Dore. He died only four days after the fourth of July, in Baghdad, from wounds of an improvised explosive device. I will never celebrate another Fourth of July without thinking of Jason and his family, and of the sacrifices that they have made. Upon visiting the ribbon ceremony for the Summit Project in February, the project took on a new momentum in my heart. When Senator King asked us all to hold our breath for 15 seconds, and then release, he reminded us of the very simple and hidden things that we take for granted – breathing and freedom. They are tied as one. Tip one on travelling up North, and a girl born and raised in Maine should be so savvy: Never enter a fire road into your GPS. I knew the way to Katahdin, but assumed the GPS knew the route to the cabins. Fortunately, for cell phone service and a good friend, I landed back en route, and fell behind the Patriot Riders. Panic had initially struck me on not having written directions, and when I fell behind the Patriot Riders, I felt a sudden calm, and elation, and I thought of how so many arrived for Jason Dore’s memorial in Augusta, and were lined up for over a mile. It poured that day. On May 24th, at the near peak, it shone for Jason and his stone, however, when we reached the peak, it rained, and it was fitting. It was somber, however, beautiful. And the families need to know this: the memorial was beautiful. Respectful. And unforgettable. “No way are we gonna quit,” said Lucille, upon the torrential rain that was experienced during Jason’s funeral in Augusta. I’ve never met Lucille, but she knew that her grandson would never quit, and that he never did quit, and that we could not. I thought of Lucille during our hike. That tenacity, and enduring love. I imagine losing my daughter to war. And it tightens my heart and closes my lungs. Most parents do not imagine such an occurrence – ever. I think that we should convene on these thoughts, when we have like-parent friends, who do the unimaginable, and face losing their sons and daughters to combat. It is a catastrophic, inhumane, loss. And we, as a country, need to recognize this. On May 23rd, when I arrived in Millinocket, I saw the people. I saw the signs: Welcoming the Summit Project; Welcoming the Families; Welcoming all that this project stood for and encompassed. It was the first of many moments that granted me a rare feeling of being exactly where I was meant to be at that moment. Upon coming in behind the convoy, I couldn’t find a parking space to save my life. The Patriot Riders, for anyone who has not had the opportunity to meet these amazing individuals, are absolutely awesome. They told me to park where I was: no worries blocking anyone in. Who’s leaving anyway? Witnessing the passing of the memorial stones of our fallen soldiers from the Patriot Riders to the soldiers’ families, was the first of many moving experiences to come. For anyone who has ever given thought to becoming a part of this project, I think that it is very important to keep the following in mind: This was an event where I knew very few people, and yet I was never alone, or on my own. I have never, in the 31-years that I have lived and travelled and taken part in different projects, experienced a higher sense of a spiritual and positive environment, than the one that I felt at the Summit Project. Every single individual involved with this project, was 110% at Baxter State Park for the love of this project, and for the dedication, spirit, unity, and all-encompassing respect for the project and how it intended to serve our heroes and their families. The spirit of all of these people shone through the rain and the ice and snow that we slipped and trampled through on Owls Peak. We were not alone while we hiked. This was something that I can bear witness to, and be grateful for. Day One. This day: Was so important. I met the father of Andrew Hutchins. And he was amazing. His love for his son, for his family, and for this project, granted me a glimpse at the purpose of this project. I carried Jason Dore’s stone, and stories, and memories with me, but with all of this, I carried so much more. The families whom I had the tremendous good grace of meeting on this first day – the stories I heard, the love, the hardships, and the hands that touched mine – carried me through this project and propelled me up that mountain like no other motivator in life could. This project’s greatest attributes exist in the relationships. The people. The families of these fallen soldiers, are of the finest people in Maine. And those who assisted in making this project a reality are absolute angels. Honor the fallen, by challenging the living. No one questions this. And this is where TSP has become a passion that Major Dave Cote has transferred to so many people. Our heroes have carried much heavier burdens. Put simply. Thank you. Our team descends on Owls Head Trail. Abol has closed, and will remain closed for the remainder of the year due to landslides. Nonetheless, TSP’s preparation for this project granted our project a trail. This trail offered challenges: snow, steady high-altitude climbs, and most importantly, a place at the summit to state our tributes to our fallen soldiers. At near-peak, it was sunny. Remarkably beautiful. I took Jason’s stone and I laid it in the red sand, as the sand mimicked the same coloring of his stone. He would have appreciated this. I think that his brother, Logan, who found the stone, would appreciate this as well. The hike down the mountain was rugged. Our team remained together. Our leaders maintained team value and respect to our fallen. No man left behind. We accomplished what I see as one of the greatest living memorials of our time – bearing the weight on our backs of the memorial stones of our fallen soldiers – who gave their lives for us. Every single one of these soldiers gave their lives, without hesitation, so that we could live, as we live. Remind our children. It is so important to raise our children with our military in mind: keeping them in prayer, keeping them in thought, and remembering that WE are, because they ARE. Remind and Remember. So that our fallen soldiers ARE NOT forgotten. If we go on living, without tributes and memorials, such as the Summit Project, it is easy and unfortunate for our country to move on without the reminder that our fallen soldiers have not died in vain, and that their memories need to and should live on and be exemplified as particles of our hearts. I had the experience of transferring Jason Dore’s stone to a man who expressed to me that this was the first stone of the project that he had ever touched. This was meant to be, for my hands to touch and carry Jason’s stone, and for this man’s hands to begin and end with Jason’s stone through the TSP at BSP event. This was the same man I encountered when I awoke early on the 24th and ventured out to the water’s edge and spoke with. I was drawn to him for a reason. Jason knew that we would be good friends at this project. Leaving the Summit Project on the morning of Sunday, May 25th, I took my time. I said good-byes. I took everything in. I breathed the air. I hugged Jeff Hutchins. He is the most sincere, passionate, and wonderful father and American you will ever meet. He alone will give you reason enough to love this project. His eyes. His heart. The sacrifices that his son, Andrew Hutchins, made for our country. I took it all in. And then I drove. Back to Readfield. But not before stopping. I stopped. I took photos of the signs. Holding the memory of the Summit Project in a summer’s moment: It’s first venture. What it stands for, and what it will continue to stand for, in the years to come. I followed out with the Patriot Riders, once again, and felt an overwhelming peace of what it means to be and to become, a part of this Project. When I mention becoming a part of this project, it is so that anyone who should have the opportunity to honor one of our fallen soldiers, should please know that it will follow you and become a part of your life in the most beautiful light possible. It is my hope, that so many people will recognize the need for this living memorial. It is my hope, that other states and communities will follow in support of honoring the fallen, while challenging the living. We live in a beautiful country, that is what it is, because of our fallen soldiers. We owe them the continuance and the ongoing pride of this project. I owe all of my involvement in this project to the memory of Jason E. Dore, 25, of Moscow, Maine; assigned to 2nd Battalion, 5th Cavalry Regiment, 1st Brigade Combat Team, 1st Cavalry Division, Fort Hood, Texas; who died July 8 in Baghdad of wounds sustained from an improvised explosive device. Jason loved his home. “Panoramic.” Jason was described as always seeing the big picture. Always chasing another rainbow. Always another hill to climb. As a final note, this reminds me of the story at the TSP final breakfast, of the butterfly urn, and how there is much more to life than we see. I am grateful to TSP for reminding us of how we need to turn our heads to the bigger picture, appreciate life, and pay gratitude to our country’s heroes. Life is not in vain. Thank you to the families who opened up and let all of us into your hearts and lives. We would not have been able to climb without the families of TSP and the stories of their children. We would have climbed, but not without the love, passion, and momentum that we did. Maine Heroes Are Not Forgotten. I wanted to leave a message for Army SPC Jason E. Dore’s mother, Gail Dore. My name is Catherine Gordon. I’m a high school math teacher and volunteer for The Summit Project and I had the honor of carrying Jason’s memorial stone during the Run for the Fallen. I talked with Kate Carey at the event and she shared many stories with me about Jason – his love for the Red Sox, how he loved to play “pranks” on people, his protective nature, and about his family, some of which she introduced me to at the race. It was wonderful to meet Jason’s grandmother, Lucille, and his cousins. The race was a profoundly moving tribute to our fallen soldiers. Before the race, a bell was rung after every fallen soldiers name was read aloud. We were all holding back tears remembering them and feeling the loss of these soldiers – deep breaths taken and then off to the starting line. As I was running the race, I was so moved by the families of the fallen standing next to their loved one’s picture cheering us on – when it was them that deserved the cheers and accolades. I waved and said many thanks to these families for their sacrifice along the route. And for the families that couldn’t attend, or where participating in the event itself, marines in full dress uniform stood next to the sign. One gold star mother told me after the race how much it meant to her to see that every picture had someone standing next to it – whether a family member, friend, or marine – everyone was remembered. And that is why I wanted to participate in the event. I wanted the families that have given all to know that we will never forget their sacrifice and that Maine heroes will not be forgotten. I thought a lot about Jason and the stories I had heard about him as I ran the course. I had just attended a Red Sox game in Boston and thought about how he loved the team. I thought about him being the last one off the plane after having another passenger tell you he had missed the flight – quite a good prank and surprise! 🙂 And I thought about how he had a panoramic view on life – looking at the big picture. What a good way to see the world, and as a teacher I hope to instill that in my students – to not be narrow minded in their thinking but to open themselves up to any and all possibilities! Upon my return home, I watched the video you made and loved how you spoke about how Jason signed every single letter with four words: Strength – Honor – Loyalty – Courage. I know your son had all those qualities and I thank you for allowing me the honor of carrying Jason’t stone – I will carry his story with me always. Maine Heroes are NOT forgotten! I’ve been trying to find the best way to describe my feelings about last weekends hike, but words are failing me. I’d like to take this opportunity first to apologize. Growing up I had several family members who were either retired or active duty armed forces. My grandfather fought courageously in Korea, and I was about 9 years old when I saw my uncle deployed to Iraq to fight in Operation: Desert Storm. As a young, impressionable kid I had nothing but admiration and respect for those that put their lives on the line to protect our freedom and way of life. My parents divorced when I was 13 and I primarily lived with my mother. I began to rebel, experimented with drugs and alcohol, and started to hang around with less than reputable people. As a high school age kid I was about as anti-authority and anti-government as someone could get, even to refusing to stand for the pledge of allegiance. Had my grandfather ever learned of that(God rest his soul), he would’ve disowned me. There was one crucial day where I and every American learned about sacrifice and duty, and that day was September 11th, 2001. Out of the blue, the sacrifices that our service members make every day became starkly apparent, and I learned at that point a new meaning of respect. Seeing high school friends and relatives shipping out to the middle east, with what were supposed to be feelings of honor and admiration were only feelings of shame and regret. Here I am, ungrateful and selfish while these people fly into the unknown, potentially paying the ultimate sacrifice for their country. For me. There were times I wish I could take everything back, but you can’t change the past. You can however, change what you do now, and from this point on. That’s why I’m so glad I was told about the Summit Project. I’ve constantly been looking ways for right my wrongs and pay it forward, and I’m so thankful for the opportunity to have participated in this hike. I had the pleasure of learning about Jason, and my only regret in all of this is that I never got to meet Jason in person. To listen to his family talk and reminisce about his life was like listening to people talk about a superhero, and hearing some stories about him, I can safely say that’s actually an accurate representation. I never got the pleasure of knowing Jason personally, but I know we would’ve been the best of friends, because that’s how he was. Hearing about the jokes and pranks he was constantly pulling, it only made me think to myself, “My kind of guy right there”. And knowing that he signed any correspondence he sent with the words Strength, Honor, Loyalty, Courage – just goes to show what kind of man he was. A true, American patriot. There were times during the hike where the terrain became challenging, but as soon as I began to think negatively about the weather, or the climb, I could feel Jason’s stone unsettle in my pack, rolling from one side to the other, or bouncing gently in its carrying case. A constant reminder of why I was doing this. A constant reminder of what people have given up for their country, for me. I fumbled with my words when telling people about Jason, but it was only because it’s impossible to process a thousand emotions and thoughts at once. When you wash everything else away and boil them down to their simplest form, all you’re left with is love. Last weekend my heart was overflowing with it. Love for my country, love for my family and friends, and a newfound love for the Summit Project. I never got to meet you, but you’ll always have a place in my heart, always. I think the Summit project is great! Jason and I have been close friends for as long as I can remember. He also, would have loved it, I’m very confident in that! Just can’t thank you enough! My name is Caitlin Burchill and I had the honor of hiking with Jason’s memorial stone during TSP’s Baxter State Park Memorial Day Weekend Tribute Trek 2015. While many of the hikers had to study up and learn about the fallen hero they were hiking for, I did not. Ever since I was graciously invited into the home where Jason grew up and met with some of his family members, I haven’t been able to stop thinking about him. Listening to Gail and Lucille describe their beloved Jason struck me and stuck with me. His passion for life, his love of family, his panoramic way of looking at the world, his love of the limelight, adventure, and trickery: a description of a truly wonderful person. I wish I could have met Jason. I think we would have hit it off, and have been great friends. While ascending and descending the almost 4,000 ft. high Owl peak at Baxter State Park, I kept thinking about Jason. The weight of his stone in my pack reminded me of his ultimate sacrifice, and his family and friends who have suffered so much. I am 25-years-old, the same age as Jason when he died. Jason gave so much, so we could be free. I do not think I can thank him enough. He was so brave. Jason accomplished more than I can ever say I have or will. I strive to be as brave and strong as he was. Although I like to think of myself as athletic, I haven’t had much experience hiking. While climbing through the tough terrain during the trek, I kept repeating 4 words to myself: honor, courage, loyalty, and strength. Words I will forever live by. Jason helped me accomplish the journey. I felt him with me the entire trip. At the top of the mountain, our group shared stories about the fallen soldiers for which we were hiking.The wind kept picking up and made things hard to hear at times. I smiled to myself. Jason was definitely trying to play a trick on us! Other than the wind, the weather was beautiful. Jason didn’t throw any rain at us…this time! While Jason’s memorial stone has reached the top of Mt. Kilimanjaro and other amazing places, I hope he would have enjoyed this latest adventure in his home state of Maine. Thank you for allowing me to hike with Jason’s stone. Jason’s life, sacrifice, and memory will never be forgotten. A few days ago (Sunday, July 5, 2015), my father Rick Bennett and I hiked to North and South Baldface in Evans Notch, NH. I had the honor of carrying Jason’s stone. What a brave young man. I am so thankful for what he did for our country. It makes me tear up to think of his love, dedication, and bravery. The hike was difficult for me, but I persevered slowly and with determination, I imagined how Jason would have handled the hike. From your descriptions, he sounded like the type of person that would have kept pushing, even in the face of adversity. You said he always “saw the bigger picture.” I’m sure he would have imagined the rewarding views at the peak, and the pride from completing the hike, and that motivated me. My father and I paused at the top and took a moment of silence for Jason. It made me think about the sacrifices that Americans like Jason make for their families, their homes, their country. Thank you for allowing me to get to know Jason. Thank you for allowing me to share in the life and memories of your son, brother, nephew, grandson, protector, hero…This was an experience that I find difficult to put down in words. I am truly honored to have partook in keeping Jason’s memories alive and showing Lincoln, Maine that our Maine heros are NEVER forgotten. Having a child with complex medical needs, we prepare for battle everyday. Countless hours of our lives have been spent in and out of hospitals, battling for life, advocating for the best possible care and praying for miracles. My son is one of my heros. However he would not have had the opportunity to overcome what he has today if not for your son, another one of my heros, choosing to spend countless days away from home, battling for LIFE, advocating for what is RIGHT and ultimately sacrificing his life for our FREEDOM. I am forever grateful for that. Jason gave that ultimate sacrifice so that those of us at home can continue to chase rainbows and overcome mountains in any way we choose. The morals and character Jason possessed do not just appear, they are traits and values that are instilled throughout one’s life. Thank you, Gail, for your part in protecting my freedom, in raising such an admirable soldier. I cannot fathom the pride that must fill your heart in raising such a wonderful son. I can only imagine the pain and anguish that must go hand in hand with that pride. I hope there is some comfort in knowing that his memory lives on. I have had, and continue to have, conversations about Jason with my two children. There IS a face to freedom and I will raise my children to NEVER take that freedom for granted, as it comes at a high cost. Just as he lived his time on earth never meeting a stranger, Jason will never be a stranger in our family. I can only hope that I am giving my children the best weapons possible to fight their wars to come. And I can only hope to succeed, as you did with Jason. Always seeing the bigger picture, while finding humor along the way. Thank you, Jason Dore. Thank you for fighting for me, my family, my country’s freedom. Thank you for allowing my to raise my family the best way I see fit. Though we are all warriors of our own crusades, we would be fighting a losing battle if not for the unselfish, brave, admirable combat of Army SPC Jason Dore. My name is John, formerly SSG John C. Curtis, retired from the United States Army. I served in various roles, positions, and units. One in particular, which happened to be my first, and most favorite, was my time spent I the 2nd Battalion 5th Cavalry regiment, 1st Cavalry Division. You may recognize this unit, because it was the very same organization your son Jason served with when he made the ultimate sacrifice. If it wasn’t for Mainer’s, having nearly the same first 3 numbers in our social security numbers (which is pretty much our number 1 identifier) I never would have known that Jason was as well, like myself, from Maine. It’s a very different bond when you serve with someone half way around the world when you grew up several minutes away from each other. The day Jason passed away will always be a day of sadness and a day of grief. Without even a clock or a calendar, we military individuals can almost tell exactly like a 6th sense, when an anniversary of one of our beloved comrades was killed in action. Jason is no different. I learned of the Summit project earlier this year. I cannot exactly remember how, but nearly any organization that takes care of or remembers our nations heroes, I always try to be apart of. When I saw what names were on the list, it was a very easy choice. Since our deployment together as well as a few others after Jasons passing, I have had my fair share of bumps and bruises and combat injuries. I have come a long way to be where I am today, and it’s simply because of men like Jason. His memory pushes me to be a greater person everyday. And it’s exactly why I chose to hike in Jasons honor, when otherwise, Most in my shoes would have struggled. The entire day was inspiring and very relaxed. Taking many moments to reflect on the soldiers stone we were hiking with. Most needed their internet sources and other like literature to learn about their hero. I only needed most of my memories. Many things I did not share with the group as I hold some moments sacred, battle buddy to battle buddy. But Jason knows, that I though of him all day, and continue to think of him always. I wished very much that I could have met all of Jasons family. Someday, I hope to fulfill that goal. Jason keep looking out for your brothers, till we meet again. My name is Jazmin Breto, and I am 16 years old. On Friday December 4th, I hiked Bradbury mountain with James Dore’s memorial stone. It was very bittersweet. I was very happy to have the honor of carrying this stone. I was also very sad that this happened to such a young man. This project is one of a kind. I’m so glad I was able to be part of this. At first I was a little weary about what I was getting myself into. I don’t like speaking in front of a lot of people. But when the time came I gained the confidence and read my speech. I felt that it was important to honor James’ sacrifice as he put himself before others. This was the least I could do. I had learned about this project shortly before this hike. I learned about all of the fallen soldiers from Maine that have died since 9/11. It really made me look at things differently. Everyone hears about the war all the time and I think it gets pushed away a lot. Seeing how many have fallen so recently and from Maine saddens me. I’m very thankful to have been given the honor to do this project. I’m even more thankful to have been able to carry Dore’s stone. Thank-you for giving me that opportunity. I was one of the students who hiked the mountain December, 4. It was a good experience and I learned new things about the military and what they do for this country. I’m an exchange student and in my country, we don’t do this kind of memorial for veterans and I think it’s a good opportunity to learn more about your country and to honor veterans. We should do this because I think it’s good to remember people who died to protect your country. Here, I met a lot of people who have family members in the military but in my country, I don’t know anyone who is in the military. It was sad to know that most of them were too young to die. Maybe they were in the wrong place in the wrong moment. Some of them were volunteering the day they died and they were only serving their country. When we were at the top of the mountain, it was very emotional to hear all of the different stories. I’m glad to have had the opportunity to carry Jason’s stone. streets of Newport to honor our brave and courageous fallen heroes. People lined the streets to watch and wave as our small parade went by. hero. You, his family, have also sacrificed much or our country. Again, it was an honor and privilege to carry Jason’s memorial stone. On Sunday, May 29, 2016, I had the honor and privilege of carrying the memorial stone of Army Specialist Jason E. Dore, as part of TSP Team Red, in Baxter State Park. We summited The Owl. To prepare for this hike, I learned as much as I could about Jason, reading the statements made by his family, and reading an article I found on the military times website. Jason was from Moscow, Maine, and was only 25 when he was killed on July 8, 2007, in Baghdad, of wounds sustained from an improvised explosive device. He was assigned to 2nd Battalion, 5th Cavalry Regiment, 1st Brigade Combat Team, 1st Cavalry Division, Fort Hood, Texas. They spoke of his passion for life, his love of family, his panoramic way of looking at the world, his love of the limelight, adventure, and trickery. From “thefallen.militarytimes.com”: Army Spc. Jason Dore, 25, was eight months into his first tour of duty in Iraq when he was injured while on patrol in a Humvee, said Tim Cates, Dore’s uncle. He died July 8 at a hospital in Baghdad. Dore, who joined the Army in 2005, attended Upper Kennebec Valley High School in Bingham before graduating from the Job Corps in Bangor. While growing in the Moscow area, he enjoyed being outdoors and fishing at Hunter’s Pond in Bingham, Cates said. “He was just a great kid. He was extremely proud of his service,” he said. Even though I never met Jason, I felt like I had made a new friend, and as I spoke about him to others on the hike, and during the entire weekend, I was glad that I was keeping his memory alive. Jason gave the ultimate sacrifice for our freedom, and he will never be forgotten. I extend my deepest sympathies to Jason’s family. My friend and I were very honored to have gotten to carry his stone up the trail we did today. We are very sorry for you loss, however, both of our Dads are in the Army National Guard so we understand the feeling of missing someone from you life. My dad has been deployed to Iraq for a year and twice to Afghanistan for a year. He just had to move to Texas for a year and carrying this stone reminded me of him. It reminded me of how lucky I am to have him home when I do, even if it is not often. Jason’s story reminded of the times when my Dad was in Afghanistan and he would Skype us at night and act like everything was fine and never let us worry or know about the terrible things he was going through, just like Jason did. Thank you for giving us and others the chance to have this experience. Today Angel Matson and I hiked up Table Rock Mountain in Maine with 30 children who all have a parent or sibling currently serving in the military. They carried 24 stones up the mountain today. Here is a letter from the campers that had the honor of carrying your hero. “My experience hiking with the Summit project was amazing. I carried Jason’s stone. It is a tragedy that his life had to end that way. At the top of the mountain I had the honor of hearing all of the stories of the fallen that my friends got to carry and it was all very inspiring. I learned that this stone is more than just initials engraved in a stone, it is a representation of a hero, It truly was awful that he went out that way. He seems like a very nice person. The day before the TSP @ ANP 2016 hike, I adopted the stone of Jason Dore. I had time to learn his stats~ Army Sargent from Moscow, Maine; assigned to 2nd Battalion, 5th Cavalry Regiment, 1st Brigade Combat Team, 1st Cavalry Division, Fort Hood, Texas; died in Baghdad of wounds sustained from an improvised explosive device at the age of 25. I was sorry I didn’t have the chance to learn more about Jason Dore, the civilian. Nonetheless, it was a beautiful day for a hike together with a new friend. As we climbed above the treetops, and the scenery opened, I immediately felt, “put in my place.” My purpose was clear. I was proud to hold Army Sgt Jason Dore’s place in the ceremony circle and share what I had learned. A couple days after the hike, I learned that Jason and I have a mutual friend who has very willingly agreed to tell me about growing up with Jason. I look forward to that meeting, to continue remembering Army Sargent Jason Dore. On Saturday October 14th I had the honor of carrying the stone and story of Jason Dore during TSP@ANP 2017. In the weeks leading up to the hike I had the opportunity to learn his story. He loved his family and home, had a panoramic view of the world. He was just 8 months into his first tour of duty in Iraq and had just 2 weeks prior re-enlisted when he volunteered to be a gunner on a Humvee for another outfit on July 8th, 2007. He was a talented writer and aspirations of being a singer. Because of Jason I was inspired to write the following poem. To his family and friends, please know I will always carry his story and memories forever with me. A unit of one for all to see. To honor those that have given their all. Just take the time to hear of the fallens stories. Then learned of their humbled beginnings. Filled with memories and stories to be shared. To begin their next journey of exploration. With one goal in common, to show our respects. Some rough, some easy and some navigationally hard. And share with these fallen heroes our gratitude. From each point of the compass we see our peak is near. In knowing we’ve kept their memories alive. To finish our mission, that we all set out to do. For the half circle that has formed is waiting for us to complete. To a Gold Star family member, friend or Summit Rider alone. This fallen hero will forever be with me. Boy Scout Troop 304 of Kennebunk hiked Big Deer Hill in Evans Notch north of Fryburg October 28, 2018. We carried 20-something Summit Project stones with us and held a memorial at the top. I carried your son, Jason’s stone in my pack. There was some snow on the ground and the day was overcast, foggy and a drizzle fell most of the time, but the woods were beautiful with brightly colored leaves still on many of the trees that late in October. I was glad to be there as was everyone in our group made up of scouts, mothers, fathers, and adults all interested in taking part in this unique memorial project. It’s a small way to remember people like Jason that stood up for his country and fellow citizens. Our troop plans to do another Summit Project hike in the future. Merry Christmas and Happy New Year.